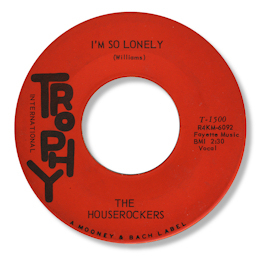 The Houserockers was not an uncommon name in the music business but I don’t think this group, who came from Lexington, KY if the label location is anything to go by, made any other discs. I’m So Lonely doesn’t feature any backing vocals so the name must apply to the whole set of musicians here. And while they acquit themselves pretty well – with a particular tip of the hat to the tenor sax player – the song is really about the passionate and compelling lead vocalist whose howls of pain are only too real. A nice one. Note ~ The lead singer may be Sonny Williams who had his own 45 on Trophy International, which featured the Houserockers, and you can find it here.